Anderson Cooper anchored an expanded two hour edition of AC360 from NYC. The two hours centered around the rambling, chaotic press conference of our current President. Anderson Cooper emceed the U.S. Postal Service's unveiling of new stamps celebrating Oscar de la Renta and his designs earlier in the day. On most mornings, Grand Central Terminal is a spot New Yorkers are trying to avoid, with throngs of commuters and tourists crowding the hallways. 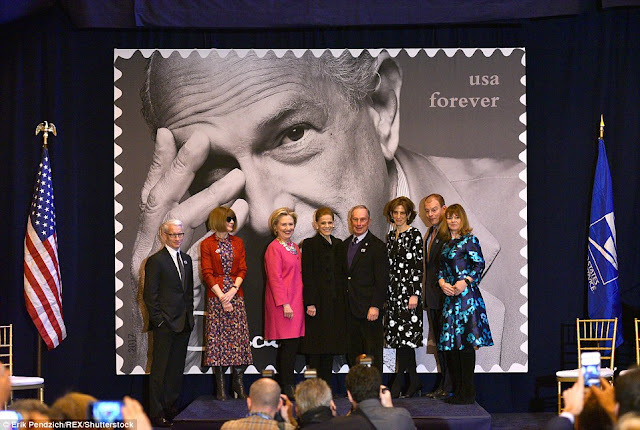 Not so today, because Vanderbilt Hall had been transformed into a reception area where the United States Postal Service would unveil a collection of 11 stamps featuring Oscar de la Renta and his beautiful designs. 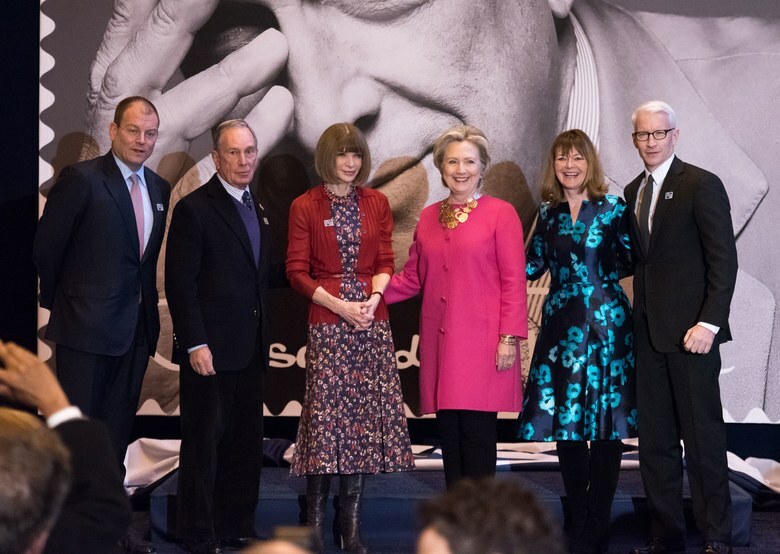 Emceed by Anderson Cooper, the event featured speeches by Oscar de la Renta CEO Alex Bolen, former Mayor Michael Bloomberg, Condé Nast’s Artistic Director and Vogue Editor in Chief Anna Wintour, and former Secretary of State Hillary Rodham Clinton. For a moment, that hall in Grand Central was New York’s most elegant place with fans of Mr. De la Renta’s and admirers crowding to catch a glimpse of what are arguably the Postal Service’s loveliest stamps. “I know Oscar would have loved these stamps. He delighted in color and pattern, in refinement and in fit, and his designs reflected his personality, optimistic and fun and sunny and romantic,” said Wintour. The collection is comprised of an Inez and Vinoodh–lensed portrait and shots from De la Renta’s runway shows including Spring 2012, Fall 2013, and De la Renta’s last collection, Spring 2015. Though Michael Bloomberg’s remarks about trying to figure out what to wear to such a posh event garnered the most laughs—he settled on a navy suit with a purple sweater and, in a festive mood, matching purple socks—it was Hillary Clinton’s speech that got attendees on their feet. To begin, Clinton echoed Wintour’s sentiments that to be among De la Renta’s friends was one of the great highs of her life. “Anna is absolutely right in saying that when you were a friend of Oscar’s, you were a friend in good times and dark times, a friend who was lifted up and carried. And we all did our best to be that for him,” she said. GLAD TO SEE HILLARY OUT AND ABOUT AND SHE LOOKS GREAT ON THIS OCCASION. BOY IS SHE HAVING THE LAST LAUGH! EVERY TIME SHE SEES THAT BRAINLESS TWIT, NO WONDER SHE GOT A STANDING OVATION! I like Jake but he is not very different from Anderson in calling people out. I mean, his Kellyanne interview blew up but Anderson called her out first last month. That too while defending Jake Tapper. Yet she went on Tapper's show. It feels a little unfair that Tapper is getting so much more press than AC is. There have been other instances too where AC and Tapper have had similar segments but only Tapper got the press. I thought AC was taking time off because he is doing so many double hours, almost every day actually. But maybe he is unhappy there. Jeff Zucker said this today "“Morning Joe gets a lot of attention but it’s completely disproportionate to the pounding that New Day is giving it,” said Zucker, who also singled out Jake Tapper for his work at the network. “It’s worth noting that you see all of Turner up here and it would be hard to argue that there’s two fresher, newer, bigger personalities in all of television right now, than Samantha Bee and Jake Tapper on the news side.”"
So the increased attention for Jake is definitely planned. I know he has always been Zucker's favorite but I feel bad for AC. He still has the highest rated show on CNN. And has been loyal throughout. And I know people here have mixed feelings about him, but he is my fave. Btw, do you like Jake? He is a conservative who was very hard on Obama. Much harder than Anderson, even. Love the Hillary pic, she looks happy :) ALso a request for the ATA team, could someone upload the Jeff Lord interview from today? It was super satisfying watching AC finally lose it with him. I wasn't able to watch today but figured Trump's news conference would be most of the show. From what I've seen of that "news conference" i'm instead calling "performance art" designed to divert attention away from Trump's and his administration's ties to Russia. I hope Anderson still covered the latest in that story and didn't let Trump's more dramatic bits deflect from what's really important here. Having said that I also hope Anderson had some coverage of Trump's comment about recent raucous Town Hall protesters angry at their representatives. Trump said "not the Republican people that our representatives are representing.” That comment should have raised eyebrows and dropped jaws across all media. Like Pragya I also request ATA please post the video of Anderson "finally lose it" with Jeffrey Lord. @pragya, AC is very capable of pushing back and challenging political figures when he wants to--it's one of the things I have admired about him over the years--I don't think he was always as tough as he should've been with Trump, but that may be true for many reporters because Trump can be difficult to pin down or shut up--it can be done though and a few reporters, like the one from NBC in the press conference Thursday did a good job of it. I think where AC and Jake Tapper differ is that Jake is more willing to give an opinion and speak more bluntly about the actions of politicians than AC is--that was evident on Thursday when Jake was discussing Trump's insane press conference with Wolf Blitzer--he didn't mince words--he called Trump's press conference 'unhinged' and that Trump wasn't dealing in reality. Jake said it would be difficult to find anyone who'd assess what Trump did in the press conference in a positive light and told Trump that he should stop whining and just get to work--he said that poor families in Appalachia the inner cities heard nothing from Trump that would speak to them or their problems, they only saw a narcissist focused on himself. I know that Anderson has prided himself on being a neutral, non-partisan reporter, but it's those times when he does speak out and push back the way Jake does that really stick in my mind and I guess that's what I wish he was all of the time but that's not his style. I think many of us started to admire AC during Katrina because of how he spoke out forcefully against the political figures who weren't doing their jobs--that's what MADE him. I guess those of us who love feisty AC will just have to be grateful for the rare times that he goes off and says what he REALLY thinks. One example of that was on Thursday's show when he asked Jeff Lord if there was ANYTHING Trump would do that he'd ever criticize--I think that was AC letting his neutral mask slip and showing his real frustration with Lord. I was never an admirer of Jake Tapper during the Obama years, I felt the criticism he got from Tapper wasn't always warranted or fair--I know I sound like a hypocrite praising Tapper for the way he goes after Trump, but I don't think anyone would disagree that Trump truly deserves the scrutiny he's getting from reporters like Tapper. President Obama (and Hillary Clinton) weren't perfect or above criticism from the press, but they also weren't a threat to the country, the world and democracy the way Trump clearly is. Beautiful photo of Hillary Clinton and Anderson, she looks relaxed and genuinely happy. @Cappy, EXCELLENT post from you on yesterday's thread. Anderson had his time in the spotlight, now it's someone elses turn. So what if Jake is a Conservative. The day of Anderson the golden boy is over, times have changed sweetie. Shep Smith of Fox News is another reporter who is speaking out strongly against Trump's lies, demanding answers from him and saying that the public has a right to know the truth. Shep Smith, like Anderson, spoke truth to power during the Katrina crisis--I'm not a Fox viewer but I appreciate anyone who calls out Trump. We posted the videos requested to tonight's (Friday's) post. Enjoy! I TOO FIND MYSELF LOOKING FORWARD TO WATCHING "THE LEAD" WITH JAKE TAPPER. WISH TO CALL IT. VILE CAN SPEAK OF ONLY TWO THINGS, HIMSELF, AND HOW HE WON THE CAMPAIGN. "FINE TUNED MACHINE," YET NOTHING IS GETTING DONE....STARTING WITH THIS NEWS CONFERENCE. TELLING A BLACK JOURNALIST TO SET UP A MEETING WITH PROMINENT BLACK LEADERS IS NOT HER JOB, BUT YOURS. PLEASE TELL US WHY YOU HAVE YET TO START GOVERNING....AND STOP BLAMING INTELLIGENCE, THE MEDIA, AND FAKE NEWS, FOR YOUR LACK OF JUDGEMENT AND INCOMPETENCE." THIS HAS TO BE DONE BY SOME SENIOR MEMBER OF THE REPUBLICAN PARTY AND UNTIL TRUMP BECOMES SUCH A LIABILITY, THEY CAN NO LONGER PLAY THEIR GAMES, THEY WILL LET TRUMP CONTINUE WITH HIS OUTLANDISH ANTICS. @ARIES MOON: I AGREE WITH YOUR ASSESSMENT OF AC. HE IS QUITE CAPABLE OF CALLING PEOPLE OUT WHEN IT SUITS HIM. I THINK HE'S WAITING FOR THE PERFECT OPPORTUNITY....A SURPRISE ATTACK IF YOU WILL..AND IT WILL COME. THERE'S DRAMA EVERY DAY. JUST THE OPPOSITE OF NO DRAMA OBAMA! completely agree with you on Shep Smith, this is the second time he has stood up for CNN even while being on Fox. Shows his integrity. I get what you are saying and you are right, but what I find strange is when AC does push back and no one notices. Let me give you an example: A couple of weeks back AC's open for 360 was "The President is spreading falsehoods." It's on the AC360 page too. Then last week Jake used the word "falsehood" on his show and Samantha Bee did a segment praising Jake for using the F word on CNN. And she praised some other CNN folks too, but no mention of AC though he said it first. Do you not find that strange? I am happy for Jake, I appreciate all journalists who do their jobs well:Sciutto, Acosta, Farenthold are some of my faves. But I don't think it needs to be one at the expense of another. And, pardon my asking, if you are so gleeful about Anderson's time being over, why are you on an Anderson blog. Since the blog is more politics more than anything now, I am entitled to my opinion. Every anchor has their time and Cooper's was before, now it is time for new blood to come in and make their name. If you don't like my comments don't read them or answer them as I will defend them every time.